Other designations: Havariler Kilisesi; Apostol Kilisesi; "Mestaba Kervansaray". "The most curious of all the monuments of Ani, I do not pretend to have quite unravelled the complexities of its plan." 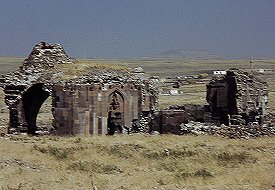 This important church appears to have been founded by the princely Pahlavuni dynasty, and been used by the archbishops of Ani belonging to that dynasty. No foundation inscription has been discovered. The earliest inscription on its walls is from 1031 and mentions a donation of land made by Abughamir Pahlavuni. Nikolai Marr fully excavated the Church of the Apostles and its adjoining buildings in 1909. In 1912 the most fragile parts of the church and the south narthex were consolidated. 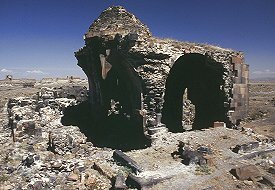 The walls of the Apostles' Church were strengthened at eight critical places. In the south narthex all the missing facing stones on the lower half of the east facade were replaced, and a wooden beam was set up to support the overhanging part of the stalactite dome. Most of this work was deliberately destroyed during the Turkish period and very little remains visible of the buildings uncovered during the 1909 excavation. In 2001 (?) 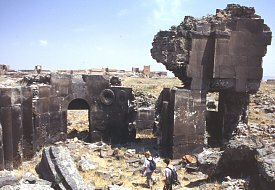 a large fragment of the roof of the south narthex fell. In 2003 the earth that had grown up around the foundations of the small church that is built against the south narthex was cleared in a very rough fashion by labourers using pickaxes. In 2004 extensive clearance work was done in and around the south narthex. The Church of the Apostles has a ground plan of a type classed as an inscribed quatrefoil with corner chambers. In other words, it has a four-apsed interior contained within a rectangular plan, with four rooms, probably chapels, filling the space within the corners. 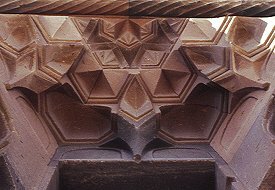 This is a design that was used in Armenia since the 7th century, but decorative elements date this building stylistically to the first third of the 11th century. The church was entered by doors in the north and the south apses. 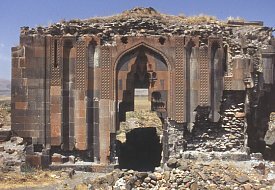 The doorways have massive lintels sculptured with a frieze of acanthus leaves set between two rows of dentils, typical of 11th century Ani doorways. Although very little of the upper parts of the church now survives, the discoveries of the 1909 excavation enable an accurate reconstruction of the church's overall appearance. The drawing below depicts the probable design of the East facade. Hollow clay containers were used within the structure of the central dome in order to lighten its weight. The roofing slabs of the dome's conical roof had bunches of pomegranates and grapes carved on them. The four corner chapels resembled miniature churches: each had an apse and a fully articulated interior, the two eastern chapels even had their own side chambers. 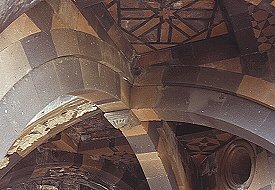 Of particular interest is that each corner chapel had a dome on a drum - a feature that made the design of this church unique in Armenian architecture. The Church of the Apostles was probably originally built in the middle of an open courtyard. Over several centuries, this courtyard was filled with buildings that eventually almost entirely surrounded the church. Only one of these buildings, the south narthex, survives to any appreciable extent. The excavations of 1909 uncovered the foundations of the others. The unbuilt-upon part of the courtyard was opposite the south-east corner of the church and the east facade of the south narthex. The floor level of the courtyard and the church was below that of the surrounding city. To the east of the church ran a street, parallel its east facade and 1.5 metres above the floor of the courtyard. From this street a staircase of six steps descended into the courtyard, in front of the south narthex. The courtyard was entirely paved with stone slabs, many of the slabs also served as gravestones. 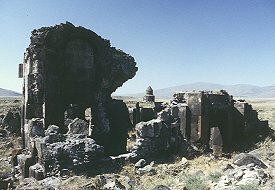 The remains of khatchkars, covered with sculpture, were also found within the courtyard. A passage, also containing tombstones, ran from the courtyard past the east wall of the church. Opposite that wall, steps led down into a vaulted room that was located under the street and that was perhaps a mausoleum. A mausoleum was built against the east wall of the north-east corner of the church. The excavators found that it was almost entirely destroyed, but surviving fragments of sculpture dated it to the end of the 12th century. A narthex was built against the north facade of the church. It also served as a mausoleum, and had an east facing apse. Based on the design of its pilasters and columns, Marr dated it to the first half of the eleventh century, at the latest. It had two entrances: one on the west led into a room with blank walls, another on the east perhaps led to the main courtyard via the mausoleum at the north-east corner. There was also a chamber constructed against the west facade of the church. It had again served as a mausoleum, and was reached by the door on the west side of the south narthex. It was found to have had a roof supported by wooden posts that rested on polygonal stone pedestals. Inside was found the broken fragments of a large khatchkar monument dedicated to Catholicos Barsegh, with an inscription (illustrated above left) that had the date 1184. In 1910 Barsegh's monument was rebuilt and restored under the supervision of the painter S. N. Poltoratski, a member of Marr's team. It was destroyed again sometime after 1921. Built against the south facade of the church is a narthex (called in Armenian a gavit) that probably dates from the early thirteenth century. 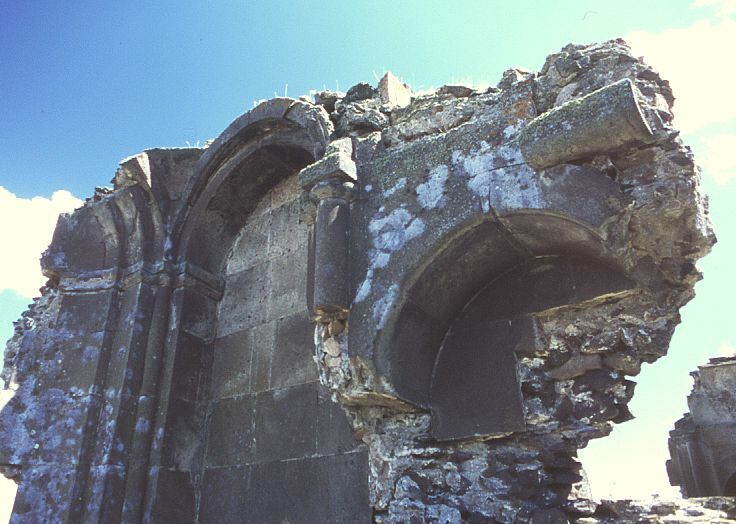 All of the south and west walls of this narthex have fallen, along with much of the ceiling over its western bay. 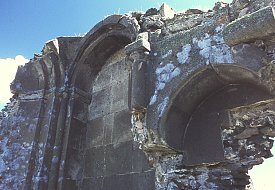 Only the eastern facade of the narthex survives largely intact. 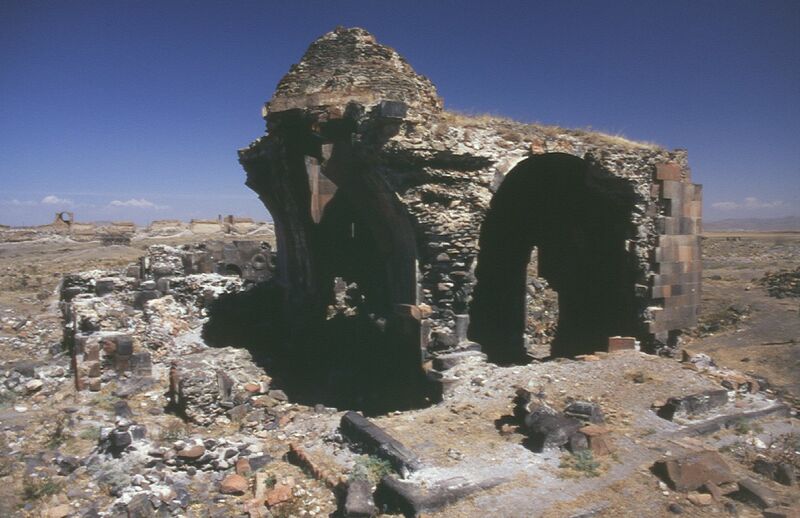 In Turkish literature the south narthex is sometimes erroneously called a "Seljuk caravanserai". 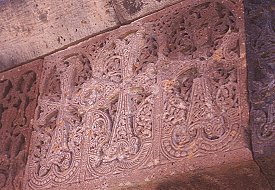 There are many Armenian inscriptions on the walls of the south narthex. Most belong to the thirteenth century (the earliest dated inscription is from 1215), with some from the 14th century (the latest date is 1348). Many of them are secular in nature: decrees mentioning exemptions from or reductions in taxes and trading levies, for example. 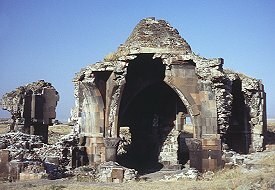 They are important because they illustrate the economic life of Ani during that period, and suggest that the narthex was used for secular as well as religious purposes. The richly carved east facade of the south narthex is strongly influenced by contemporary Seljuk and Iranian art. 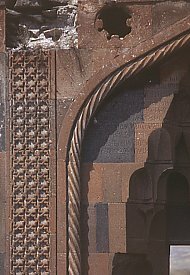 The entrance takes the form of a pishtaq - a portal that is inserted into a niche in the form of an iwan and surrounded by a decorative frame. 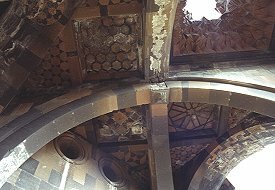 The roof of the niche takes the form of a muqarnas vault. The frame has a twisted moulding that forms the shape of an ogee arch. Above this arch, in the position where, if it were a Muslim structure, one might expect to see carved or ceramic roundels, there are porthole windows. 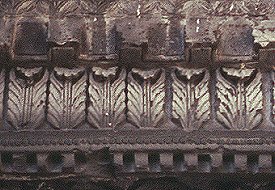 The rest of the facade comprises shallow, v-shaped niches alternating between vertical bands of decorative interlace carvings. The contrast between the flat surface of the exterior facade and the dynamism of the interior could hardly be greater. The ceiling is supported by two pairs of diagonally crossing arches, at the apex of which is a stalactite moulding. 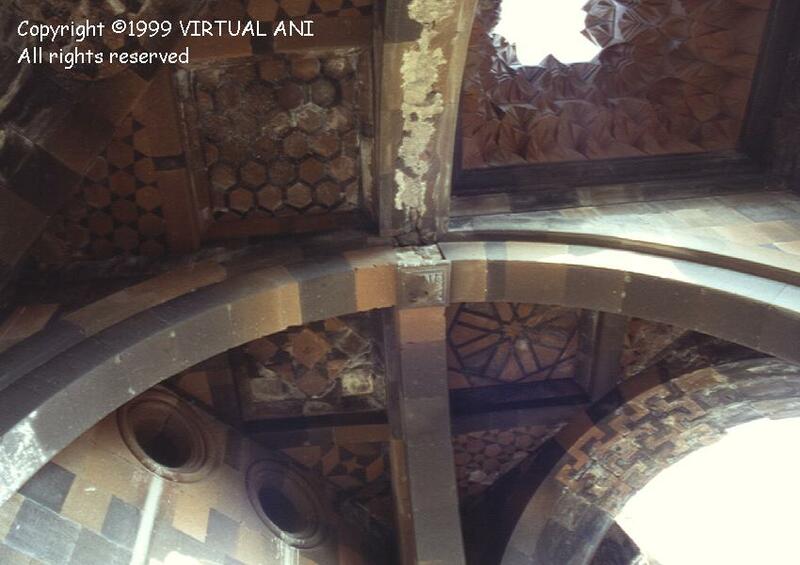 These arches frame a lozenge shaped central compartment that has a finely carved stalactite or muqarnas dome. This dome is said to have had an oculus opening at its pinnacle (although there appears to be no surviving visual evidence for it). 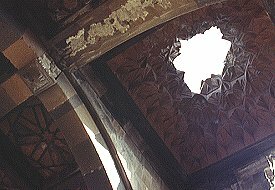 The remaining compartments have flat ceilings that are very richly decorated with patterns formed from inlaid red, brown, and black stone. The whole interior is a tour-de-force of stone-working skills. 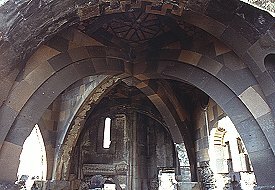 The design of this narthex, with arches that cross diagonally rather than perpendicular to the walls, is perhaps unique amongst Armenian buildings. The deceptively simple floor plan of two square bays is emphasised on the lower parts of the interior by the protruding pilasters. However, the insertion of the domed central compartment over these bays results in a startling effect of space flowing into each other, something rarely seen outside of Baroque architecture. To the south of the south narthex was a small church that was older than all the other structures on the site. It was located above the ground level of the rest of the courtyard, and was even above the ground level of the adjoining street. It had a single nave ending in a semicircular apse. There was an annex room to the south of the apse, but none to the north - Marr speculated that the original north wall of this church had been amputated to make room for the south narthex. A metre to the south of this small church, and at the same ground level, was yet another building that had served as a mausoleum (and into which ovens had been added at a later date). Here the excavators found a slab bearing an interesting bas-relief that may have originally been part of either the mausoleum or the small church. It depicted pomegranate trees with branches bearing fruit and leaves: stylistically, it could have dated from as early as the seventh century. 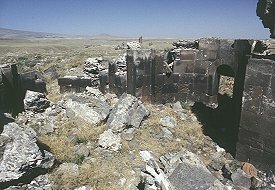 This page [Apostles's church at Ani] was first published in 1999. It was last modified on the 5th February 2004.